In 1944 Republic Pictures came out with another jungle girl serial The Tiger Woman starring Linda Stirling as the Tiger Woman. Sterling’s costume is actually a leopard print but whatever. Two rival oil companies are trying to get the rights to drill in a jungle which is protected by the Tiger Woman and her tribe. 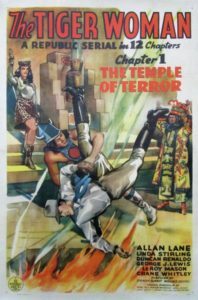 Allen Saunders (Allan Lane) works for the one oil company but teams up with the Tiger Woman to fight the more evil oil company. 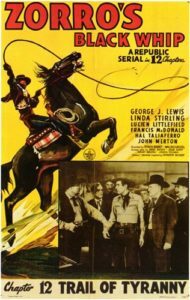 The movie was such a hit that Republic quickly started production on another serial starring Linda Stirling, Zorro’s Black Whip. Despite having Zorro in the title he’s never seen or mentioned in the serial. It’s 1889 and the territory of Idaho is about to vote to join the union and became a state. Opposed is the villainous Dan Hammond (Francis McDonald) who owns the local stagecoach has his gang start terrorizing the citizens into not voting. Hammond is a respected citizen so he does all this in secret. The Black Whip has been stopping the raids. Randolph Meredith (Jay Kirby) runs the local paper and is also the Black Whip. While preventing another coup the Black Whip is shot and killed. Randolph’s sister Barbara Meredith (Linda Stirling) finds her dying brother takes his costume and becomes the Black Whip. U.S. agent Vic Gordon (George J. Lewis) helps out Meredith and the Black Whip. In fact in the later chapters he starts wearing the Black Whip costume to protect Meredith’s identity. Apparently the bad guys couldn’t tell that they are fighting a woman. Sterling would go on to star in several serials but never really the lead hero again.